Last time I put together the purse frame bar and pivot, so now it is time to add the purse frame rings. First a confession – I am cheating by using 8 gauge bronze wire. 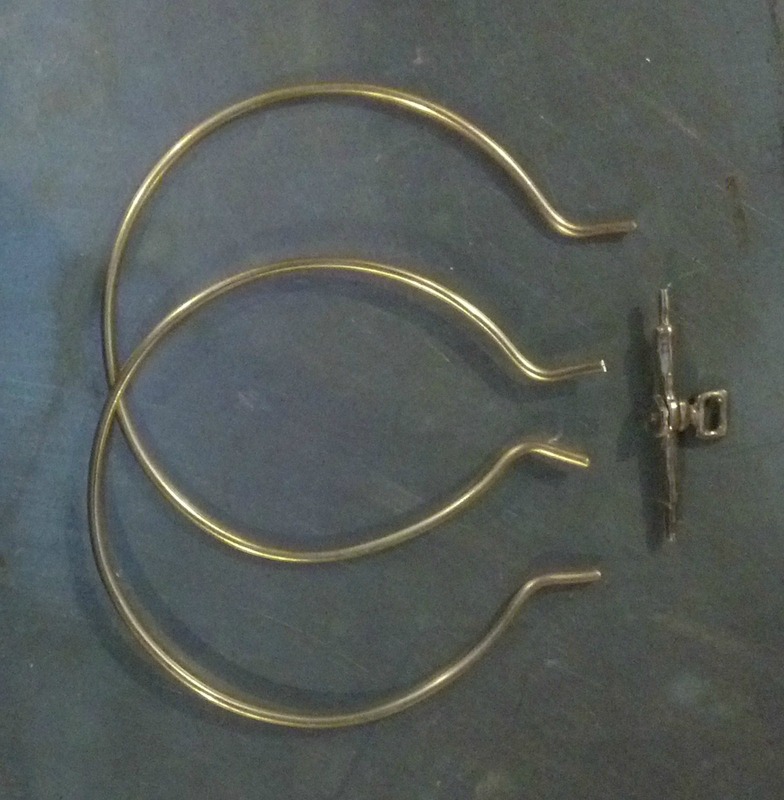 I have seen purse frames, usually the lowest quality ones, that use plain old wire rings. I was faced purely with a time issue. With all of the events that I am currently doing there was simply no time to be able to cast the type of “chevron” shaped ring that I wanted to use, so that project will happen in the future. 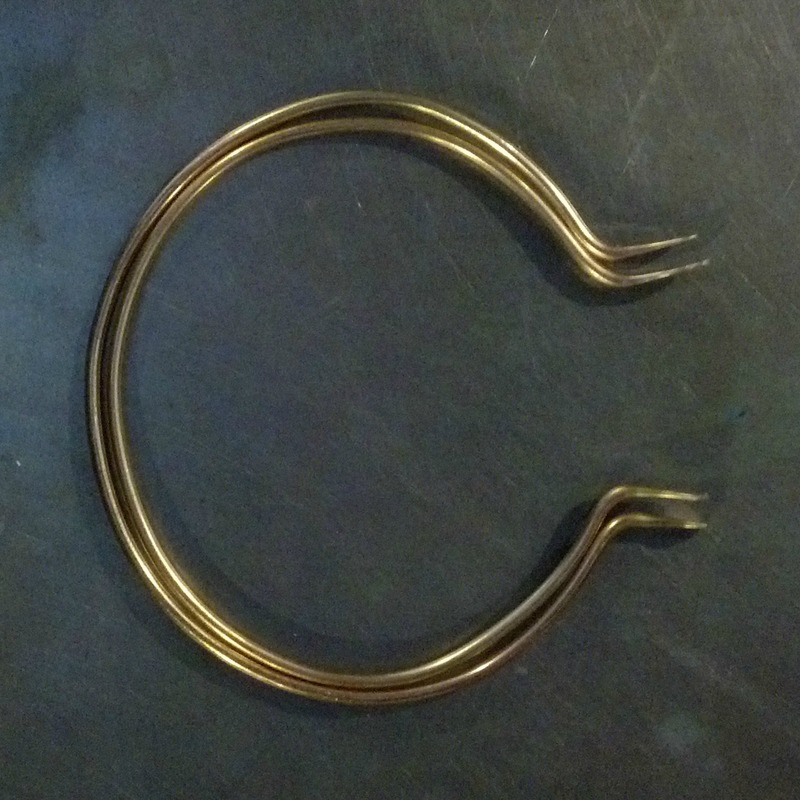 Why is the chevron shape important for better quality purse rings? The previous “L” or “chevron” shaped purse rings that we looked at used part of the “L” to provide a location for holes to sew the bag of the purse to. Although this is an important benefit, it is possible to simply wrap the material of the bag around the ring and sew it in place. So why is the shape so important? Strength. A plain round wire will bend much more easily, even if it has been hammered to make it harder. The basic structure of an “L” shape makes the ring much more stiff and less susceptible to bending. So back to my process. I looked at the purse frame from the Museum of London that had a surviving ring. 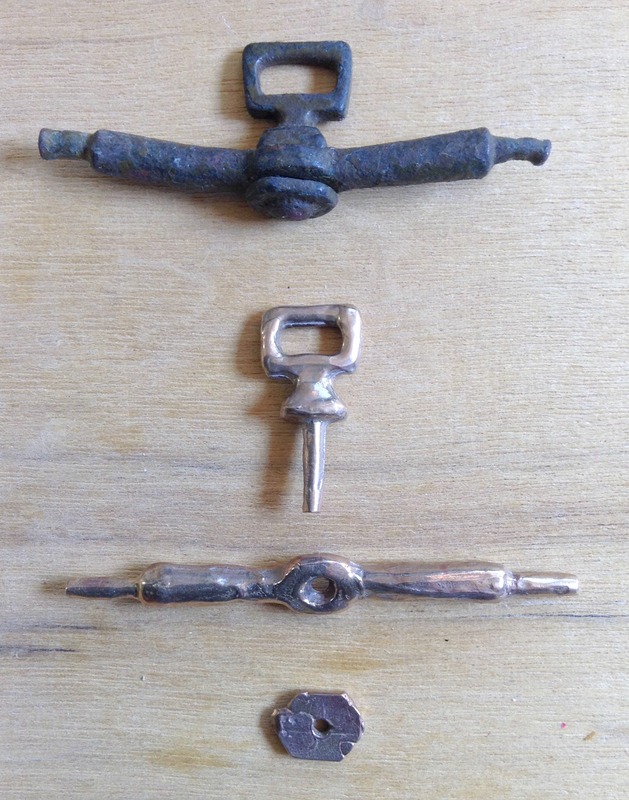 What I was looking for was the shape of the ring and the proportions of the ring to the purse bar. So I went in search of a round item that was the correct size. And here it is, a small paint can. 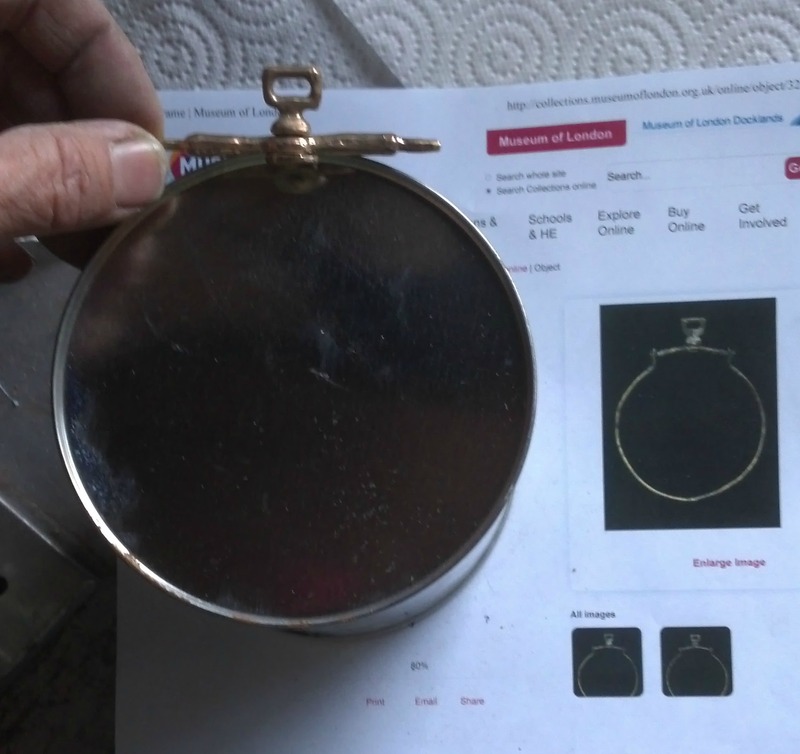 The picture compares the can and purse bar to the picture of the purse frame at the Museum of London. Pretty darn close. So I wrapped the 8 gauge wire around the can and started forming the tabs that will go up to the purse bar. Here they are, fresh off of the paint can with the purse frame . So now it was time to adjust the rings so that they actually nest inside of one another and the tabs don’t interfere with one another. A little work with a pair of pliers accomplished that, and then it was time to flatten the ends of the wire rings. Here they are in progress. Once they were flat enough I cleaned off the rough spots with a file. And checked the fit of the rings one more time. Almost perfect! One of the tabs on the inner ring is a little too long, so I re-trimmed it and filed it again. Then it was time to create the holes that would allow the rings to fit onto the purse frame bar. Mark the location of the holes with a punch, so that the drill bit will not slide around. Then drill the holes and smooth off any burrs with a file. And what do we get when we put it together? We get something that looks a lot like a purse frame with rings. The fit is pretty close, just a little work with a pair of pliers will make it perfect. Purses Part 9: Time For Metal! Last time you saw the molds for making wax replicas of the purse pieces. Well the next obvious step is to turn those wax replicas into metal. I cast metal (bronze, sterling silver, and pewter) on a fairly regular basis. Bronze and Sterling are what I think of as “hot” metals – they require temperatures of over 1700 degrees Fahrenheit in order to melt and become liquid. Pewter, on the other hand can be melted on a camp stove (500 to 600 degrees depending on the alloy). The technique that I use for casting most of my “hot” metal is called Lost Wax Casting. 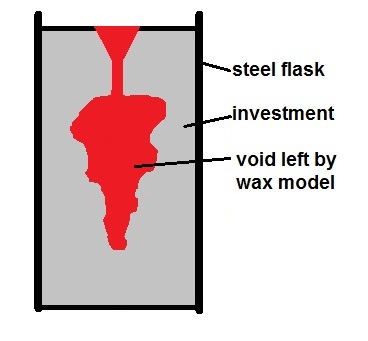 A basic summary of how this works is that the waxes are anchored into a stainless steel flask, a plaster like substance, called investment, is poured into the flask and allowed to harden. The flask is then turned upside down and heated. The wax flows out, and in the later stages of heating (over 700 degrees), burns away completely. The investment is now the mold into which the molten metal will be poured. 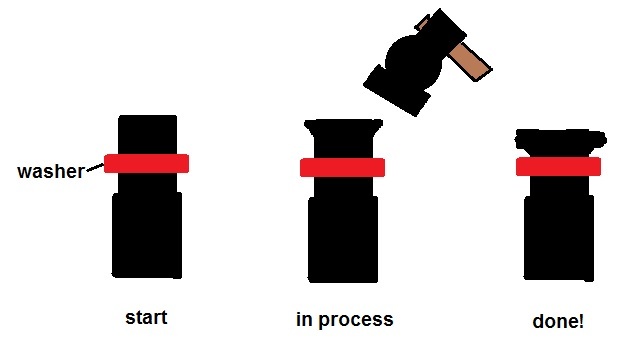 The image below shows the basic layout of the stainless steel flask, wax and investment. This flask is ready for the molten metal to be poured in. So, I put my waxes into flasks, invested, heated, and poured my metal. And the result? This picture shows the original artifact, and the newly cast, and cleaned up, bronze replicas. So what happens now? Well, I spent a bit of time filing and fitting the pieces together, and removing any rough spots. I wanted the pivot to spin easily, just like the original artifact does. Once I had the pieces fitting together well, I needed to measure exactly how long the pin on the bottom of the pivot needed to be. If I cut it too short there will not be enough metal to peen over to hold the frame together, and if I cut it too long the fit of the frame will be super loose, and probably bend when I try to rivet the end. The fit on all of the period frames that I have seen is always fairly snug. So I marked the pin with a magic marker with the washer in place. This picture shows the marked pin with the washer off. I couldn’t find a smaller tipped marker (the Studio elves must have borrowed it again), so I knew that I needed to make the cut about half way across the ink mark. 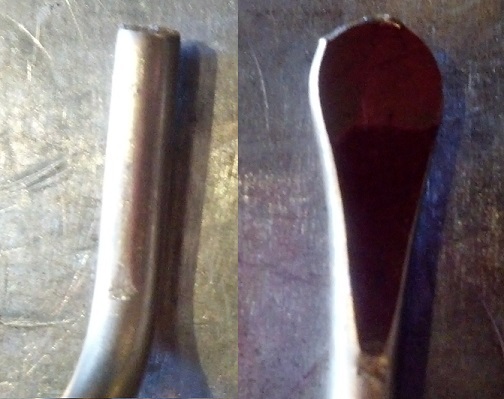 I cut off the bottom of the pivot pin, smoothed the end, made sure that the end was at a right angle to the pivot pin, and reassembled the purse frame. The assembled purse frame was then put into a machinists’ vice and the end of the pivot pin was peened over with a hammer. And here is a picture of the result! Purses Part 8: Where Do We Go From Here? I realized after I posted the last blog that some folks might not have a clue about the process of riveting. 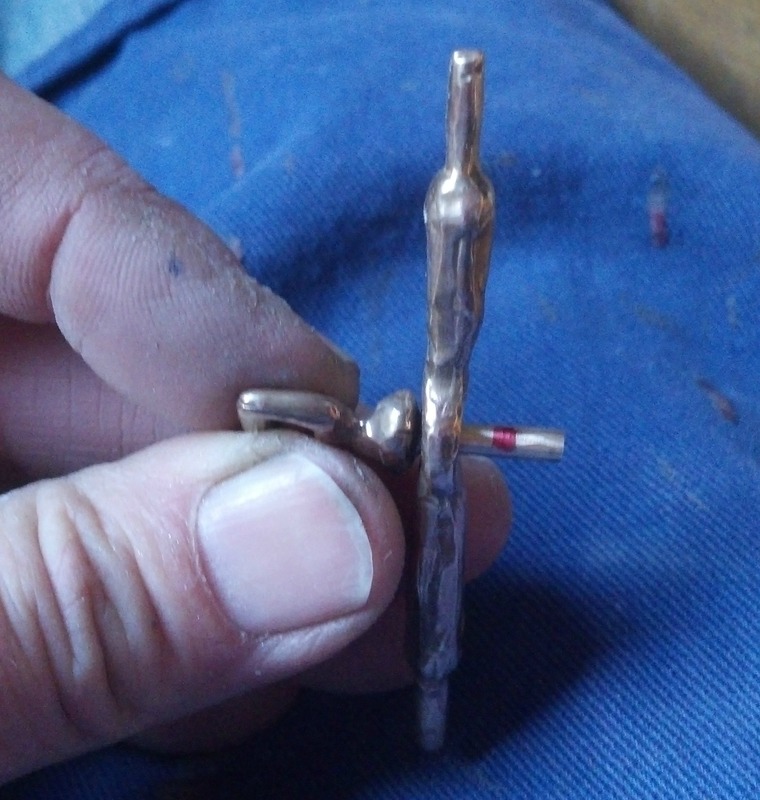 Riveting was one of the most common methods for joining base metals together prior to the advent of modern soldering techniques and fancy gas torches. If you are interested in reading about modern soldering techniques. I wrote a blog on the technique a while ago. But back to riveting. I made a quick, and not particularly artistic, picture of the basic riveting process. How is that for a fancy hammer?! But hopefully this gives you the basic idea. The metal of the rivet, or the end of the purse frame bar or pivot is simply moved by hammering. But back to my process! I also spent a ton of time looking at examples in museums. 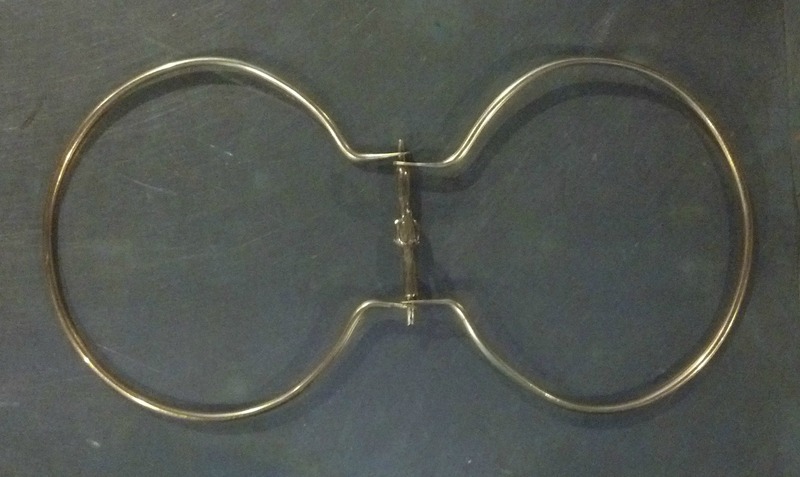 I found several at the Museum of London that had a similarly shaped purse bar and pivot. This purse frame was photographed upside down, but you can see that it is very similar. And this purse frame is not only similar, but also has a surviving purse frame ring. Excellent! Now I even have a potential model for the ring on my purse frame! Next it was time to actually make a mold of the frame that I have. 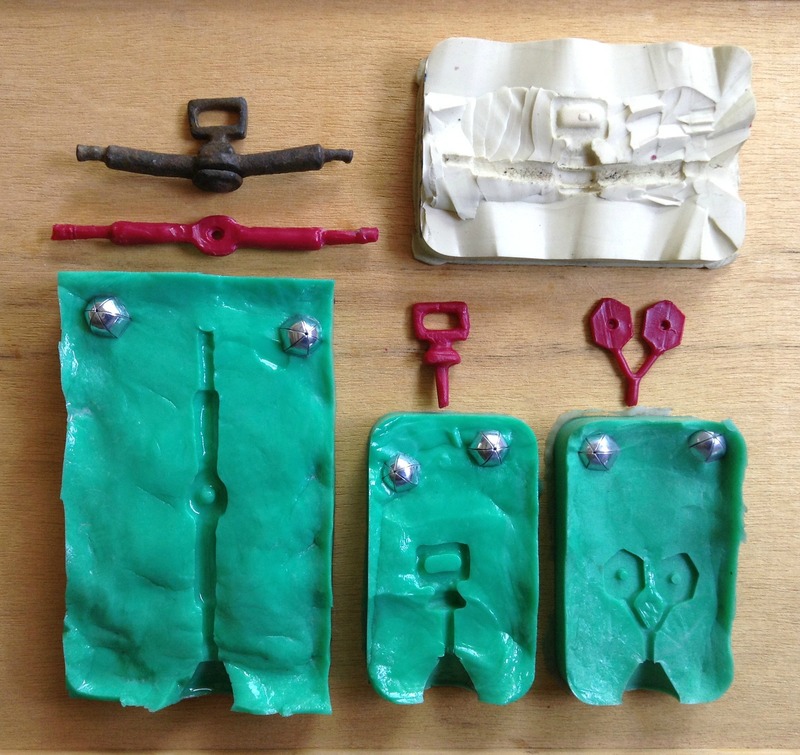 I used modern materials to make my molds. Because the actual artifact is metal I was able to use silicone mold sheets to make the initial mold. This material requires heating, in a special press known as a Vulcanizer, to create a rubber-like mold. Once this mold was created I was able to remove the original artifact and inject molten casting wax into the cavity of the mold. This wax creates an exact replica of the original artifact. I made several copies of the original purse frame in wax, and then began cutting the wax apart into the individual pieces that make up the purse. At this point it was possible for me to repair any flaws in the original purse frame pieces, like corrosion or other pitting. Once the individual pieces of the purse looked the way I wanted them to, I was able to use another modern silicone mold material, called Room Temperature Vulcanizing Silicone (RTV), that allowed me to easily create a mold of the individual wax replicas of the purse pieces. Here is a picture of the original artifact and half of the Silicone mold that I made from it. At the bottom of the picture are the three RTV molds that were made of the individual repaired waxes. The new waxes that can be cast from these molds are the red objects above the RTV molds. You can see that I extended the worn and peaned ends of the original purse bar so that they would be long enough to hold new purse bar rings and still have room to be peaned over. I also extended the central pin on the pivot of the purse so that it will be long enough to go through the purse bar, put on the washer (shown on the right) and still have room to be peaned over. Next Time: Time For Metal!